Photo by: Chris Haston/NBCNBCU Photo Bank(HOLLYWOOD) — So far, in the past year, we’ve gotten reboots of Queer Eye, Murphy Brown and Roseanne, a Mad About You revival is coming soon, and the cast of Frasier is mulling bringing their show back. 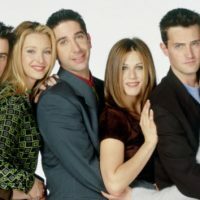 But you can stop asking for a reboot of Friends, co-creator Marta Kaufman tells Rolling Stone. It’s not happening. Kaufman is referring to the fact that millennials and Generation-Z’ers — including her teenage daughters — are now bingeing the show thanks to its run on Netflix. Of course, Kaufman understands the appeal of the sitcom that made us all pals with Ross, Monica, Chandler, Phoebe and Rachel, and made their unrealistically huge New York City apartments fans’ home away from home.